* The first song festival took place 18.-20. June in 1869 in Tartu. 4 orchestras with 56 wind instrument players (and 822 singers) took part in it. * First wind orchestras were established and began their activity precisely near Tartu (Väägvere, Torma and other orchestras). * The first national wind music day took place on 3 July in 1965 in Tartu, it’s leader was conductor Ando Rannu. * The first international wind music day took place in 1991 in Tartu, it’s leader were conductors Ilmar Lääne and Aadu Regi, our friends from an orchestra of Ireland took part in it. * In 1995 took place Tartu Wind Music Days, where performers were, among others, Kotka City Wind Orchestra from Finland and Tartu county’s wind orchestras. The leaders were Sirje Ginter and Kaido Otsing, in assistance was also Margus Kasemaa. * For years there were different events of the Tartu Promenade Music “Emajõe suvi” that was organized by conductor Margus Kasemaa. * There were mainly three people active during the beginning of International Wind Band Festival – Kaido Otsing, Toomas Peterson and Margus Kasemaa. Time has shown that wind musicians need their own festival and within these years the festival has become highly important for the main organizer Margus Kasemaa. 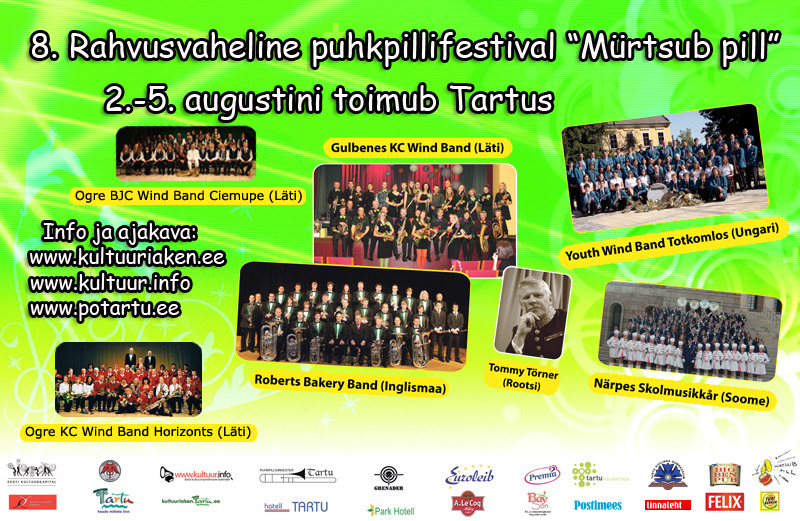 * In 2014 took place the 10th International Wind Band Festival „Mürtsub pill“ and Tartu Song Festival – there were 1558 wind instrument players on the song festival stage and it was all thanks to our festival’s cooperation with Tartu Song Festival. * In 2015 there was a fantastic 11th International Wind Band Festival “Mürtsub pill” with many quests from abroad and many participants from all over Estonia. * In 2017 we had a great 12th International Wind Band Festiival "Mürtsub pill" with two stages and lots of guests from abroad. There have always been song festivals, wind music days in Tartu and they have always been together with wind musicians. Now is the number of wind musicians the same as the number of people in the first song festival long ago. 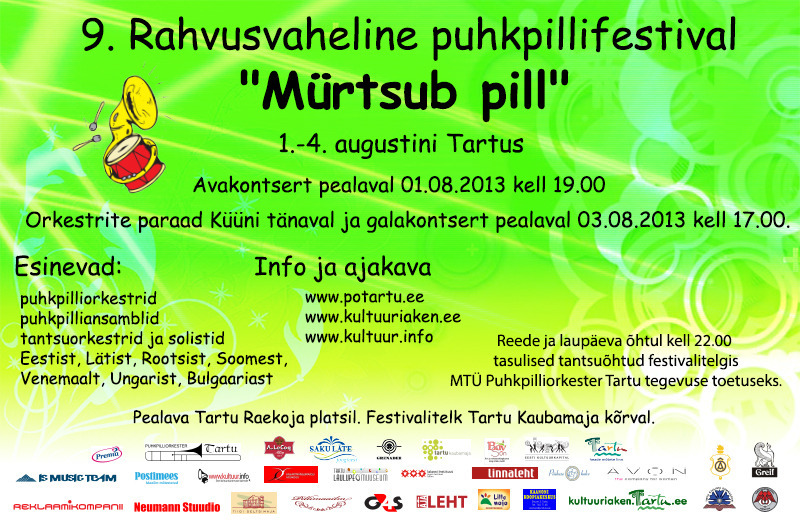 Isn’t it fantastic that it has all been taking place in Tartu? 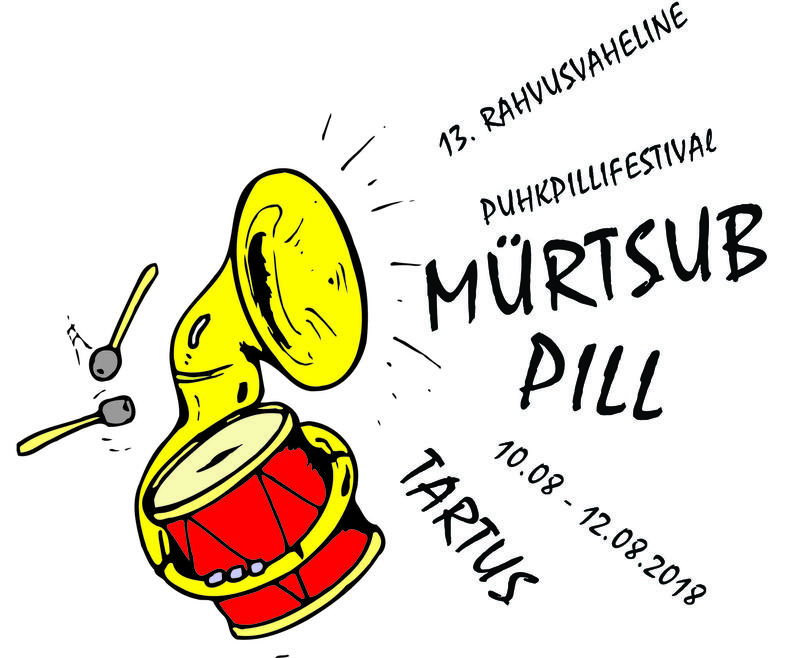 So, let’s meet again in Tartu, in 13th Internationl Wind Band Festival "Mürtsub pill" in 10.-12.08.2018, and make it a wonderful festival! Thank you all who come to listen, dance, enjoy or play! Festival’s artistic director Margus Kasemaa.